The playing characteristics and health benefits of Har-Tru tennis courts make them the #1 choice for court owners. Har-Tru courts promote the game for life, from early childhood into retirement. Har-Tru granular surfaces act as a shock-absorbing cushion, allowing players to slide into their returns, preventing the joint jarring stops all too common on hard surfaces. A recent study revealed that one out of every two tennis players is likely to suffer an injury during a six month period. The study attributes injuries of the lower extremities, the back and the groin to two factors: court surface and shoes. Unique tennis surfaces that permit sliding, as a Har-Tru tennis court does, result in 85% fewer injuries than hard surfaces. Avid players find that Har-Tru courts allow them to play the game every day without soreness or pain. Har-Tru courts, also known as clay courts, have several advantageous playing characteristics. A Har-Tru court provides a consistently slower ball bounce than other surfaces, resulting in longer rallies, a greater variety of strokes and a more controlled game. Playing tennis on a Har-Tru court requires the development of strategy and skill which promotes endurance and patience. The rise of the European and South American players on the men’s and women’s professional tours has been largely attributed to learning the game on clay courts. The United States Tennis Association is now encouraging its most promising players to train primarily on clay tennis courts by installing Har-Tru courts at all of its national training centers. Har-Tru courts are ready for action in a matter of minutes after a rain shower. Water is absorbed through the surface and into the base. The slope of the court then allows excess moisture to run off. Since a Har-Tru court retains moisture and breathes during the hottest days of summer, the surface remains an average of 20% cooler than hard courts – a real advantage in Florida and the Sunbelt states. Florida Blend Fast-Dry Material has been the preferred product for tennis court owners in Florida for over 20 years! Florida Blend is made from the same green metabasalt rock as Har-Tru. However, Florida Blend Fast-Dry has been specifically formulated to withstand the rigors of the Florida environment, including extensive rain, wind and year-round play. Florida Blend Fast-Dry is designed to stay on your court longer, promoting superior playability day and night. This is a great product for clay courts throughout the southeastern U.S. Available in 50 lb., 80 lb. or bulk bags. Har-Tru is the most popular clay court surfacing material in the U.S. Har-Tru is manufactured from an igneous metabasalt greenstone rock outside Charlottesville, Virginia. The greenstone rock is crushed in to many particle sizes and blended with gypsum binder to create Har-Tru, the best tennis surface on the planet! Har-Tru is designed for use on sprinkler-irrigated courts and is available in 50 lb., 80 lb. or bulk bags. 10-S Tennis Supply is the largest distributor of Har-Tru and can ship anywhere in the world. HydroBlend Court Material is specially formulated Har-Tru material that is used on subsurface irrigated Har-Tru courts (HydroCourts, HydroGrids and Cal-Cap) and is available in 50 lb., 80 lb. and bulk bags. 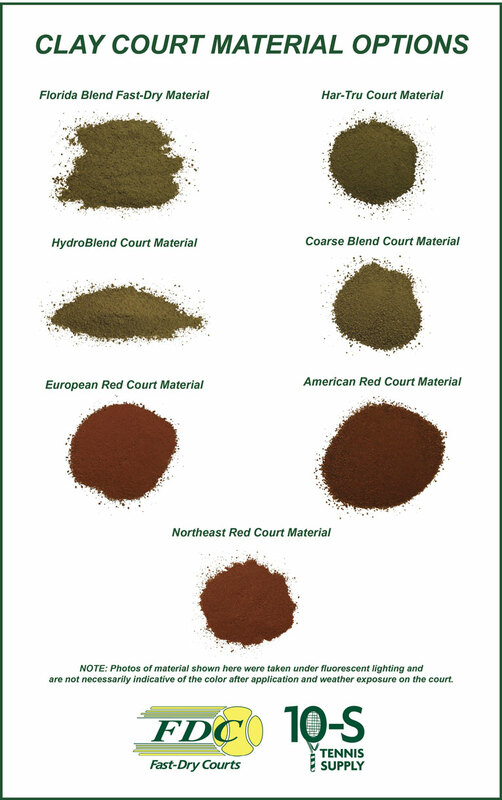 Coarse Blend Court Material is specially formulated Har-Tru material that is designed for use as a top dressing on subsurface irrigated courts (HydroCourts, HydroGrids and Cal-Cap) and is available in 80 lb. bags. This rich red product leaves its mark in a way no other surface can. Not just on the clothes and the ball but in the heart of a tennis player. Our European Red is ideal for top-dressing existing real clay courts and covering red ClayTech (synthetic turf with clay in-fill) courts. It has also been used as a cap on top of existing Har-Tru courts to seal off the green and leave the fiery red/orange finish on display. The product is produced from crushed bricks and is imported in 55 lb. bags. Har-Tru’s American Red Clay is composed of red stone and brick dust combined in a time-tested formula to produce exceptional playability and a beautiful deep burgundy red. While American Red Clay provides the rich color many people long for, it does so in a formula that behaves more like Har-Tru. This means simpler maintenance and very consistent playability. American Red is formulated specifically for installation with HydroCourt sub-surface irrigation. American Red typically has a greater amount of loose top dressing than a green Har-Tru court and consequently plays a bit slower. Red material is more popular than ever and Northeast features high-quality Red Fast Dry or Red without binder. A rich color infuses the stone, which ensures the color won’t drain away. Provides the top-notch playability you expect from Northeast with a wonderful, deep red color gives your court a European flair. Fast-Dry Courts, Inc. specializes in the construction, resurfacing and maintenance of Har-Tru (clay) tennis courts. Founded in 1987, we provide professional, high quality tennis court construction services to court owners throughout Florida. We are also the world’s largest builder of Har-Tru courts with our FDC HydroCourt subsurface irrigation system. Fast-Dry Courts, Inc. provides its customers with a complete set of tennis court construction services, everything from initial design and consultation to new construction to resurfacing, repairs, lighting, and fencing. 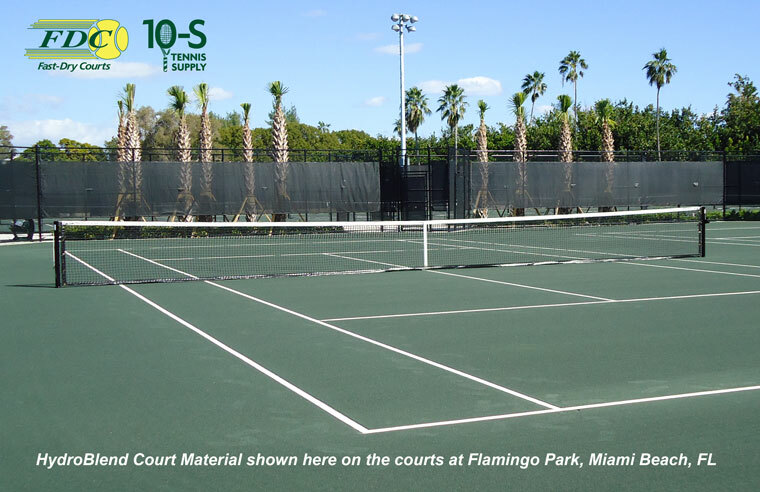 We also offer a complete line of tennis court supplies and accessories through our sister company, 10-S Tennis Supply (www.10-s.com). In short, we are here to support you for the life of your court. Feel free to contact us with any questions you may have – 800-247-3907.